A virtual guide to Bangladesh, an independent country since 1971, named officially People’s Republic of Bangladesh. The country is situated in southern Asia in the Ganges River (Padma) delta on the Bay of Bengal. Bangladesh is bordered by India in west, north and east and has a short border with Myanmar (Burma) in south east. The state occupies an area of 143,998 km², compared it is slightly larger than Greece (131,957 km²) or slightly smaller than the U.S. state of Iwa. It is one of the world’s most densely populated countries. Bangladesh has a population of more than 164 million people (in 2017). The majority of its population are followers of Islam (about 88%). Capital and largest city is Dhaka. Spoken language is Bangla (or Bengali by 98%). Chittagong (2.8 million), Khulna (1.8 million), Rajshahi (1 million), Mymensing, Comilla, Barisal, Sylhet. Location: Southern Asia, bordering the Bay of Bengal, between India and Myanmar. Climate: Semitropical, monsoonal; mild winter (October to March); hot, humid summer (March to June); humid, warm rainy monsoon (June to October). Languages: Bangla (official, also known as Bengali), English is widely used. Literacy: 54% for males; 32% for females; a total of 43% literacy. Natural resources: Natural Gas, Lignite Coal, Limestones, Ceramic, Clay and Glass Sand, arable land, timber. Potatoes, Vegetables, Bananas, Mangoes, Coconut, Tea and Wheat. Industries: Garments, Jute, Cotton, Textile, Tea, Paper, Newsprint, Cement, Fertilizer, Sugar, Engineering, Electric cables , Leather, Fish. 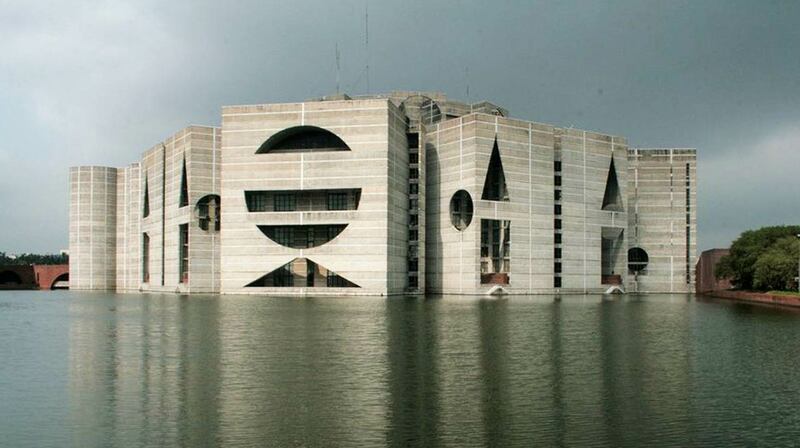 Bangladesh is a parliamentary representative democratic republic with a multi-party system. Legislative power is vested in both the government and parliament (Jatiyo Sangsad). Head of state is the President. Head of government is the Prime Minister. Official site of the Prime Minister Office. Bangladesh’s representation to the UN. Embassy of Bangladesh in the U.S. Address list of Bangladesh’s Diplomatic Missions Abroad. Addresses of Foreign Missions in Bangladesh. National Statistical Office of Bangladesh. Searchable map and satellite view of Bangladesh. Searchable map and satellite view of Bangladesh’s capital city. The National Parliament House (Jatiyo Sangsad Bhaban) is the house of the Parliament of Bangladesh, located in Bangladesh’s capital Dhaka. Wikipedia article about Kazi Nazrul Islam (24 May 1899- 29 August 1976), the Bengali poet, writer, musician, and revolutionary and the national poet of Bangladesh. Bangladesh related portal with entertainment and lifestyle news. A site dedicated to one of Bangladesh’s unique popular arts, the paintings and decorations on the three-wheeled cycle ricksha. Bangladesh’s economy has grown at an annual average of about 6% over the last two decades, despite political instability, poor infrastructure, corruption, insufficient power supplies, slow implementation of economic reforms, and the 2008-09 global financial crisis and recession. The economy of Bangladesh is largely dependent on agriculture (rice). The garment sector is the largest employer of women in Bangladesh. Garment exports, the backbone of Bangladesh’s industrial sector, accounted for more than 80% of total exports and surpassed $25 billion in 2015. Official website offers national economic data, periodical reposts, currency museum, notifications, press releases. Official website of the Dhaka stock exchange. Bangladesh’s second stock exchange, located in the port city of Chittagong. The national flag carrier of Bangladesh. Bangladesh’s leading private domestic airline. The second private airline in Bangladesh offers domestic service and since 2008 also flights to international destinations. A herd of Chitals (axis deers) deep in the Sundarbans, the largest mangrove forest in the world. Best time to go: October to March. Main Tourist Attractions: Colourful tribal life of Hill Tracts, world’s longest sea beach at Cox’s Bazar, centuries old historical sites at Dhaka, Paharpur, Mainamati, Mohastangar, Sundarbans the home of the Royal Bengal Tiger, largest tea garden, reverine life, ect. 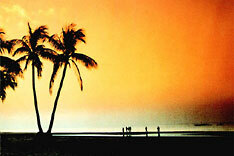 A guide to Bangladesh by Bangladesh Tourism Board. A guide to Bangladesh by the National Tourism Organization. Makes You More Familiar with Bangladesh. 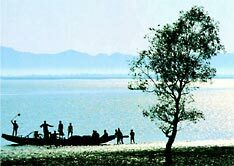 Find almost everything there is to know about Bangladesh. The ancient city in the south-west part of Bagerhat district in the Sundarbans contains some of the most significant buildings of early Muslim architecture of Bengal. 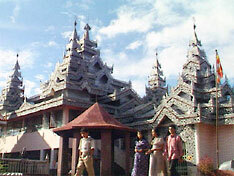 Ancient monastery-city with ruins of an extensive Buddhist complex. One of the largest mangrove forest in the world, covering the delta of the Ganges, Brahmaputra and Meghna rivers in the south of Bangladesh and the southern part of West Bengal (India). The Sundarbans are known for its wide range of fauna, including some hundred bird species, lizards, mud scippers, dolphins, and the threatened Bengal tiger. The oldest institution for the study of Engineering and Architecture in Bangladesh. Public university located in Chittagong, founded in 1965. Oldest University of Bangladesh, estabilshed 1921. The apex body of all Government Funded Universities, with Information on Bangladesh Universities. Organisation for the application of space science. The agency for the planning, promotion, co-ordination and overseeing the implementation of environmental and forestry programmes. DOE’s mission is to help secure a clean and healthy environment for the benefit of present and future generations. 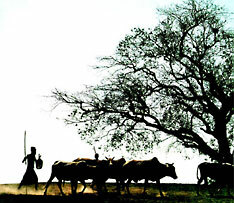 The site of BEN provides information on Bangladesh’s environmental issues. The centre monitors the rainfall and water-levels throughout Bangladesh. Online archive of the chronology of events of the almost unknown Genocide in Bangladesh in 1971. History of the war for Bangladeshs Independence 1971. The Father of The Nation of Bangladesh. History of Bangladesh summary by the Commonwealth of Nations organization.